Netflix has released its latest monthly ISP speed index and Reliance Jio GigaFiber has been declared to have the best average Internet speed in India. Earlier this year, Reliance Jio started taking registrations for the highly anticipated Jio GigaFiber broadband service, but the service is yet to receive a wider public rollout in India. As per Netflix ISP Speed Index for October 2018, Jio GigaFiber’s average monthly speed increased from 3.41Mbps to 3.48Mbps. Interestingly, the Internet service provider had debuted at the top of the list in September this year. While Jio, a new entrant in the sector, continues to maintain its position as the top telco in India in terms of affordability of data consumption, incumbents have been coming up with plans and offers to match Jio’s prices and bundled data. However, Jio GigaFiber is yet to see a wider rollout but is expected to be available across the country soon. Netflix’s ISP Leaderboard shows that Jio GigaFiber continues to stay on top for two months in a row, while Airtel managed to receive the fourth position. 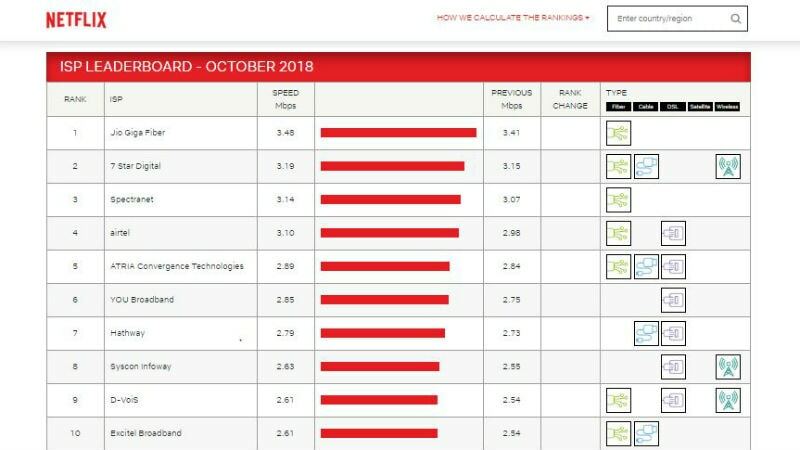 Meanwhile, 7 Star Digital has been positioned at the second spot in Netflix’s ISP Speed Index for October 2018. Its monthly average speed increased from 3.15Mbps to 3.19Mbps. In October, 7 Star Digital managed to topple Spectranet, which is now at the third place in India. At the fifth position in the list released by Netflix, is ATRIA Convergence Technologies. Spectranet, Airtel, and ATRIA Convergence managed to deliver monthly average speeds of 3.14Mbps, 3.10Mbps, and 2.89Mbps respectively during October. Further, the top 15 was rounded off by YOU Broadband, Hathway, Syscon Infoway, D-VoiS, Excitel Broadband, Alliance Broadband, Tikona, BSNL, MTNL, and Tata Communications. It is worth noting that India does not even feature in Netflix’s list of top 10 internet providers in the Asia-Pacific region. In this list, Hong Kong is at the top with a monthly average speed of 3.85Mbps while India has a monthly average speed of 2.73Mbps. Globally, Switzerland has the highest average speed, that is 4.18Mbps. “The Netflix ISP Speed Index is a measure of prime time Netflix performance on a particular ISP and not a measure of overall performance for other services/data that may travel across the specific ISP network. Faster Netflix performance generally means better picture quality, quicker start times and fewer interruptions,” Netflix noted in its blog.